This post originally appeared at Usable Knowledge at the Harvard Graduate School of Education. The maker movement — think of it as “smart DIY,” a high- and low-tech approach to tinkering that turns users into inventors — is spurring excitement about the power of ingenuity in fields as disparate as robotics and design and agriculture. (Even the White House has hosted a Maker Faire.) Increasingly, the movement’s appeal is spreading among educators, who see its celebration of hands-on creativity and empowered problem solving as a doorway to a rich array of learning possibilities. What can students gain from an approach to education that focuses on so-called maker experiences? How can a maker-centered approach to learning — one that incorporates building, crafting, or engineering in digital or physical space — help develop students’ sense of competence or agency? Agency by Design (AbD), a multiyear research initiative at the Harvard Graduate School of Education’s Project Zero,an Educator Innovator partner, is investigating just these questions — chronicling examples of maker-centered learning across the country, gathering thought leaders, and reviewing literature in order to position the trend within a context of best practices. 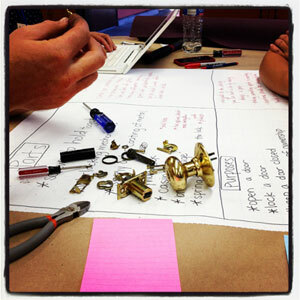 AbD is fostering new kinds of DIY (or, more accurately, DIT — “do it together”) learning in real classroom settings. It is partnering with PreK–12 educators in Oakland, California, to develop instructional strategies and tools to help students think critically about the design of objects, ideas, and systems — and to test the notion that maker-based experiences can increase students’ self-efficacy. In many settings, particularly on college campuses, enthusiasm about the maker movement — and about innovation itself — has often seemed to dovetail with the values of entrepreneurship and start-up culture, or has reflected excitement about how the movement can enrich STEM education. But by articulating a credo of what it calls maker empowerment, Agency by Design aims to show how sensitivity to the designed dimensions of the world can enhance learning at a broad level, across disciplines, and contexts. -Tatum Omari, a teacher at North Oakland Community Charter School, describes the “ridiculously exhilarating” process of taking apart a doorknob at a recent AbD workshop and reflects on how the initiative has given participating teachers a greater sense of agency, too. 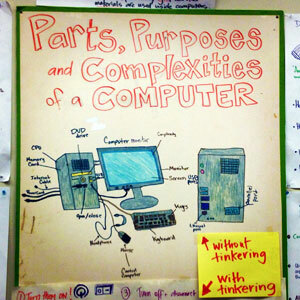 -Another AbD educator, Jenny Ernst, of the the Park Day School, describes a training workshop that asked educators to “mechanically dissect” common electronics or appliances and talk about the parts, purposes, and relationships they noticed within each object. -Thi Bui, a teacher at Oakland International High School, describes how design thinking and maker culture can enrich English language learning. -Fellow Oakland International High School teacher Brooke Toczylowski has written a series of blog posts discussing her incorporation of AbD concepts in several aspects of her professional work. In the coming months, AbD will announce the launch of a national learning community and a corresponding website, and it will release its maker-centered thinking routines — resources that can help teachers everywhere incorporate the maker ethos into their classroom plans. Follow Agency by Design on Twitter and Instagram. Watch Agency by Design project manager Jennifer Oxman Ryan’s TEDx talk on the maker mindset. LEARN with Marginal Syllabus (December): What’s Radical about Youth Writing?